will this repair the HDD or just waste time? At least a diagnose might be a good idea to judge it. I'd need a screen in TestDisk after confirm at analyse from your current partition table. Might be a check if any partition exists? Also to convert your hdd didn't help as much. It looks klike that you have problems about your file system. If there would be a partition, a boot sector diagnose helpt in some cases and user were able to list their files and copy them. If Deeper Search finds something, please check it. Check that partition and press p to list your files. If you receive an error message, please let me know. no error message as of yet... just read error at 2 more sectors... only 2% done >.< this is gonna take forever.. If you have only 2 percent, just quit it! Need a screen from your partition table (current partition structur is described) from the menu analyse. I assume it would be not possible to write anything to your MBR. A boot sector diagnose is not possible either, because you need a partition where you can have a boot sector diagnose from. In your case it might be safe to use datarecovery software. 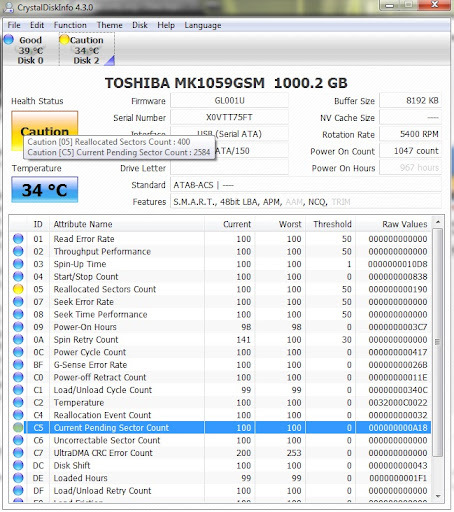 Might be an idea to check the status of your disk using smartmon or CrystalDiskInfo portable (it doesn't need to be installed and provides smart values also - easy to use). Another hard way would be. Convert your disk back using intel. hdat2 tries to repair bad sectors. But often difficult to use on USB? Then to have a try to register your partition in your partition tabel / MBR. Chkdsk is an utility to have a try to repair a file system, but is not intended to recover data. Everything is on your own risk! any hint on how it might have got damaged? It's a good idea to backup your disk. If you make an image you can use TestDisk to work with it also. Your situation is difficult to judge. I've seen users were have been unable to format their disk. An USB HUB with power adapter helped to solve that problem. In case diagnose your disk using chkdsk /r to determine, do you have soft bads (repairable) or bad sectors (physically damaged). In case of bad sectors, replace it.